As the year reaches its close in Japan, attentions immediately turn to the New Year and this means…cooking and cleaning! 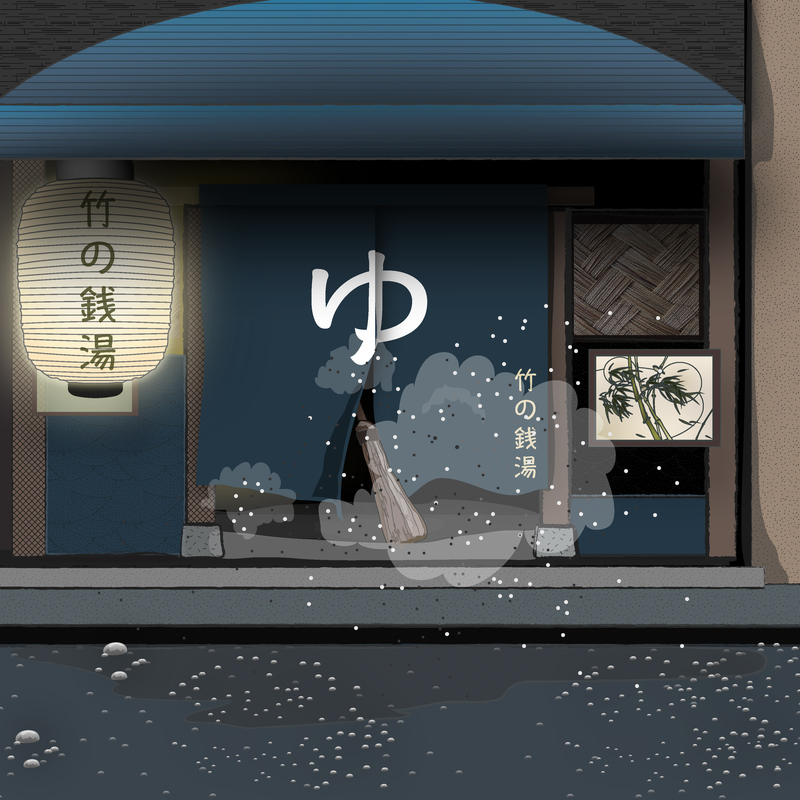 It is very important in Japan to welcome the new year in a clean state – and so Osoji (大掃除) takes place – extensive cleaning that is thought to purify the residence/ workplace so that the god of the coming New Year “Toshigami-sama” may be welcomed. 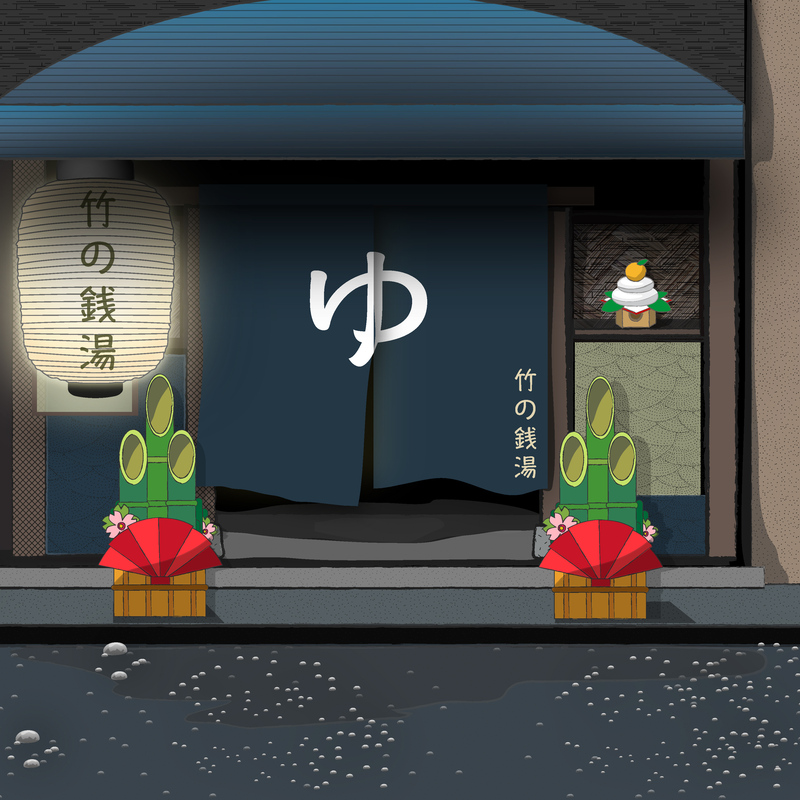 After the cleaning is done, the New Year decorations can be placed around houses and businesses, such as ‘kadomatsu’ pine and bamboo displays placed outside entrances and gateways. Elements such as bamboo, pine, and daidai (a variety of bitter orange) are believed to symbolise longevity, good fortune and health. At the Bamboo Bathhouse in Tokyo, Mama Kojin bustled around the kitchen preparing special dishes to be eaten in the days after the New Year (known as osechi ryori/ お節料理), and Boss Panda rounded up every available pair of hands to clean the Bamboo Bathhouse top to bottom. 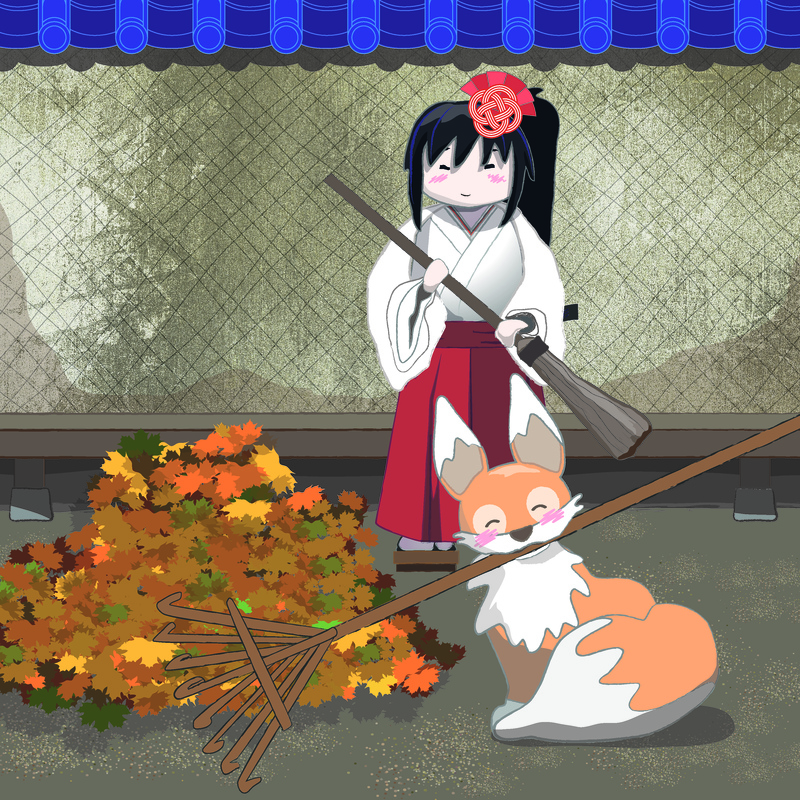 On the 30th of December, Kiku-san was raking the garden leaves and Miko-chan had picked up a broom to sweep the engawa*. They had paused for a moment to chat when Boss Panda began to chuckle at them. “You two look just like ‘Jotomba’ from the legend of Takasago!” he exclaimed. He suggested that they have a break whilst he told them the story, and so they sat together enjoying the last of the day’s sun and crisp December air. The large bear continued, “They are often represented in the form of dolls (in wood, ceramics or textiles) in front of a pine tree – and because they are said to represent a happy family life are commonly given to newlyweds, and the Takasago song recited at weddings. They can also be presented on major wedding anniversaries and are sometimes given by a community to a couple on their 60th wedding anniversary”. Boss Panda smiled. “You two reminded me of that contented couple just then, each holding your tools whilst preparing the Bathhouse for the coming year – and I hope you both have long and happy lives”. 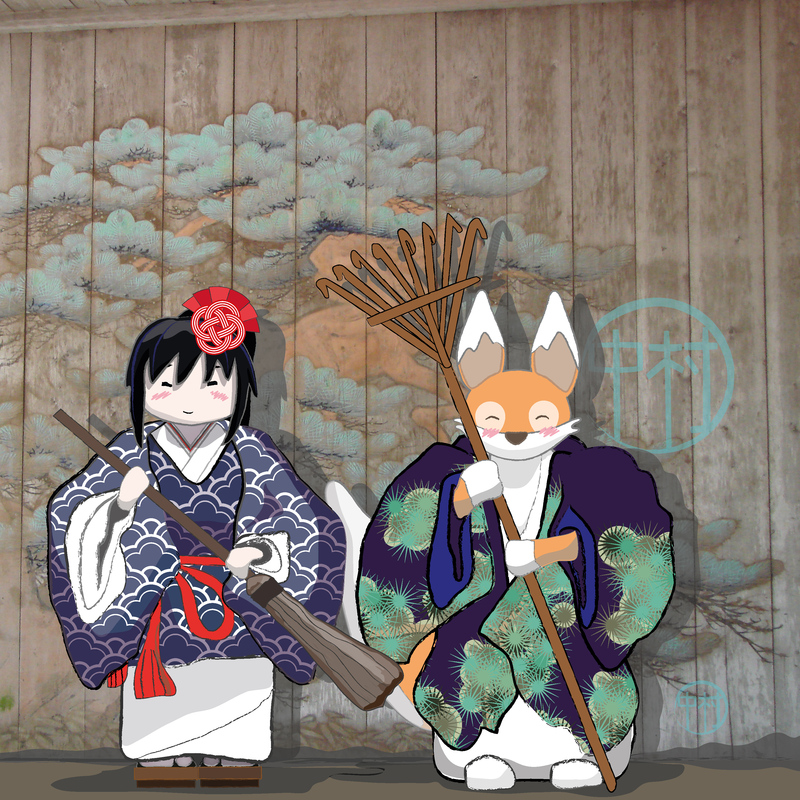 The little fox and his best friend the shrine maiden doll felt very fortunate to have found each other and the guidance of Boss Panda and Mama Kojin, and both wished for continued good fortune in the coming year. *Engawa = verandah-like corridor found in traditional Japanese architecture, providing a living space between inside and outside. Your illustrations are so beautiful–I hope you can turn them into published storybooks one day. There is a lovely gentle tone in your stories and you manage to make them stories, but also impart cultural information too. I would have loved to read something like this to my children when they were young. And as an adult I cherish it too, and wish I had it between two covers. Thank you so much – I’m hoping that the seasonal almanac drawings will one day complete a book or calendar of sorts, and that Kiku’s story fills out a little more so that I could publish his tale, or his guide to Tokyo! Loved this one. Such a beautiful story. I hope to clean today to welcome the new year with open arms. Thank you so much! It is so nice to welcome the New Year with a clean house! Have a very Happy and Healthy 2016!